Behind-the-head version of H-5010. Soft adjustable strap fits under safety cap. For noise levels > 100 dB. Behind-the-head version of Model H-5030. Has soft adjustable overhead strap that fits under safety cap. For noise levels to 100 dB. Note: Headsets have 30", 2-conductor cordset with 1/4" phone plug. Alligator clip adaptor available. See Accessories. 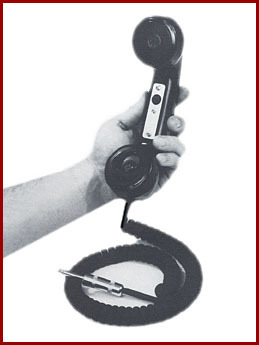 Handsets are available with or without push buttons and with coiled cordsets, straight cordsets or armored cable. Coiled (R) and straight (S) cordsets terminate in either alligator clips (C) or a phone plug (P). Armored cable (AR) models terminate in tinned wires. The handset pictured to the right is MODEL SPT-550 RP . The handset push button is the equivalent to a hang-up switch. Handsets without push buttons are therefore always on and are best limited to applications involving simple pair-phone operation. Handsets with push buttons are off-line until the push button is depressed and are intended for multi-phone set-ups. The PTT handset is wired so that only the transmitter is activated by the push button. The receiver is always on. This configuration is required by certain fire codes relating to high rise buildings.